This was the sixth season in which the competitors had underwritten the prize fund and the series continued to struggle, due in large part to the SCCA's continuing refusal to support it. Only three races were held in the US, the usual one in Mexico and the remaining five in Canada. As if the SCCA weren't enough of a problem, the FIA decided to get involved. Noting the existence of a successful formula in four parts of the world, North America, Australa and New Zealand, Japan and England, the FIA decided to institute a World Championship, to be called Formule Mondiale. Engines could be allowed up to 2-litres with engine manufacturers bearing the cost of administration and prize money. It would have helped if the FIA had lined up the teams and at least one engine manufacturer before they announced this. The North American entrants were unanimously against Mondial but could do nothing to stop it. The 12-year-old CASC series would end but there was talk of starting a separate West Coast series. Meanwhile, the 1982 championship went into its final round having seen eight different winners in eight races and with eight drivers still having a mathematical chance of winning the title. It was won by 36-year-old Kiwi David McMillan, a veteran Formula Super Vee driver who had first raced in the Atlantic series back in 1977. See also Gordon Kirby's seasonal survey in Autosport 11 Nov 1982 pp24-26. 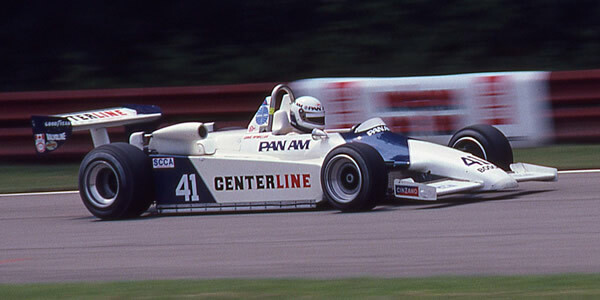 Ralt RT4s were the dominant cars of 1982, all of the top nine competitors running a 1981 or 1982 specification RT4. McMillan used his own 1981-spec car, the one he'd used to win the 1981 New Zealand series, as well as sponsor Ray Lipper's 1982-spec car. Doug Shierson fielded a pair of March 82As but the F2-based car was overweight and simply didn't work on the spec Goodyear crossply tyres. The new Tiga showed promise in the Garvin Brown team. Of 195 recorded starts in the 1982 series, 119 were in Ralts and just 45 in Marchs. Tiga scored 11, the Johnston JM6 six, and Brabham, Hayashi and Toleman just one each. All Canadian and North American Formula Atlantic results have been compiled by Chris Townsend using Canadian Motorsport Bulletin, Formula, Racecar and On Track magazines and Competition Press and Autoweek.